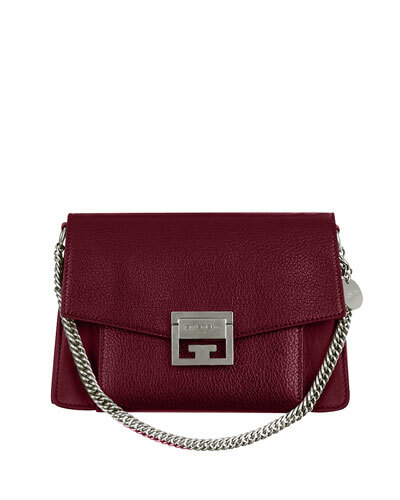 More Details Givenchy medium shoulder bag in pebbled goatskin leather. Chain shoulder strap with logo disc. Removable shoulder strap. Flap top with logo-engraved flip-lock closure. Exterior, zip-around and slip pockets at front. Interior features multiple compartments. 7.1"H x 11.4"W x 3.2"D. Made in Italy. 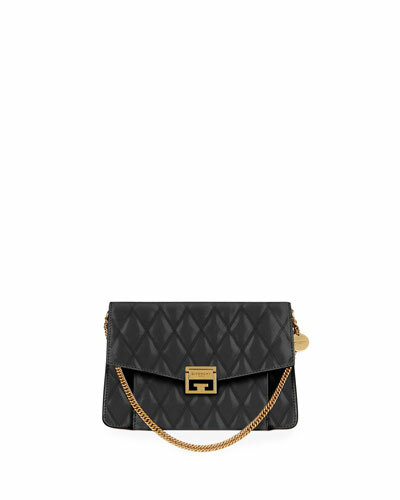 More Details Givenchy medium shoulder bag in diamond-quilted goatskin leather. Chain shoulder strap with logo disc. Removable shoulder strap, 17.3" drop. Flap top with logo-engraved push-lock closure. Exterior, zip and slip pockets at front. Divided interior; slip compartments. 7.1"H x 11.4"W x 3.2"D. "GV3" is made in Italy. More Details Givenchy soft leather shoulder bag. Cutout, wrapped top handle. Knotted shoulder strap. Full flap with snap closure. Divided interior; one slip pocket. 8.7"H x 12"W x 3.2"D. Made in Italy. 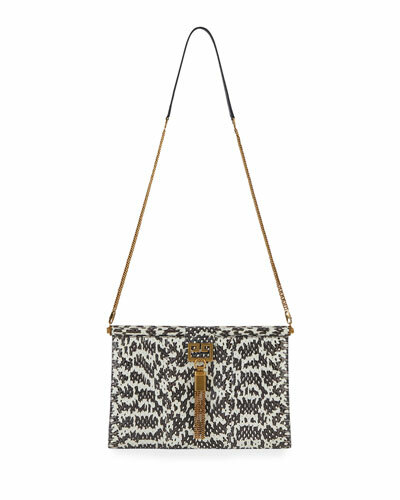 More Details Givenchy shoulder bag in Ayers snakeskin and smooth calf leather. Cutout, wrapped top handle. Knotted shoulder strap. Full flap with snap closure. Divided interior; one slip pocket. 8.7"H x 12"W x 3.2"D. Made in Italy. More Details Givenchy shoulder bag in diamond quilted leather. Removable chain and leather shoulder strap. Framed top with push-lock closure. Metal logo detail and hanging chain tassel at front. Interior, suede lining; one slip pocket. 7.3"H x 11.2"W x 1.4"D. "Gem" is made in Italy. More Details Givenchy shoulder bag in genuine snakeskin. Removable chain and leather shoulder strap. Framed top with push-lock closure. Metal logo detail and hanging chain tassel at front. 7.3"H x 11.2"W x 1.4"D. "Gem" is made in Italy.